Why is permit on the menu at “hip” Miami eatery? Andrew May 15, 2018 Conservation, News, RECENT, Slide No Comments on Why is permit on the menu at “hip” Miami eatery? 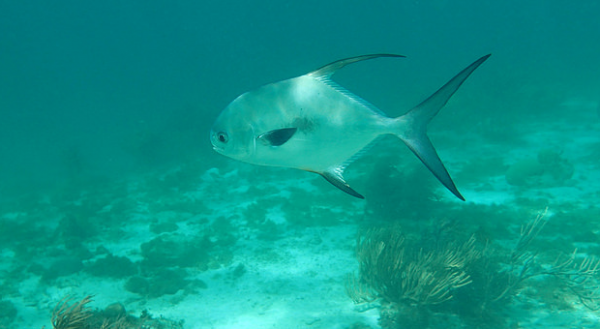 Anglers have fought to protect this fish. So how did it wind up on a Miami Beach menu? Backpedaling Top Chef contestant McGinnis condescendingly argues, “I know a lot about fishing, dear. Whoever it is who’s telling you [it’s a permit] doesn’t know what they’re talking about,” Renowned marine biologist, Aarron Adams, disagrees. One of Miami Beach’s cool new restaurants, a laid-back fish shack named for Biscayne Bay’s iconic stilt houses, aims to serve fish so fresh that its celebrity chefs claim much of the catch comes from the docks across the street. Just one problem: A trophy fish that sport fisherman have long fought to protect wound up on the menu. Last week, Miami New Times reposted a picture taken in November of Stiltsville Fish Bar chefs Jeff McInnis and Janine Booth gripping two large fish. In the picture, Booth holds a shimmering permit, a game fish found on South Florida’s endless shallow flats, beloved by anglers for its powerful runs and fierce fight, and almost never featured on menus. McInnis, a Top Chef contestant and founding chef behind Yardbird, another popular Miami Beach restaurant with downhome fare, at first said the fish was an African pompano, which can grow to a similar size, but more closely related to jacks, found around deep wrecks and less restricted. But Friedman and Aaron Adams, a marine biologist and chief scientist at the Bonefish & Tarpon Trust, both identified the fish as a permit.